Barents Sea, September 28, 2009. Heavy air-carrying cruiser Fleet Admiral of the Soviet Union N.G. 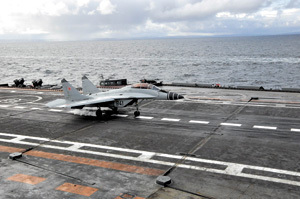 Kuznetsov heads to north wind at full speed – such course simplifies deck landing. Over the deck spiraling down flies an aircraft with identification marks strange for ship's crew. This is serial MiG-29KUB produced at RSK MiG by order of Indian Navy. At subsequent whorl the aircraft touches deck by landing wheels and takes off again – the dress landing rehearsal is finished. In a few minutes the fighter having hooked barrier cable stops at bulkhead of Kuznetsov. The lantern is up. Deck crew and experts of RSK MiG salute pilots, but there is no exultance on their faces: let have it straight, the first deck landing of a new aircraft is anything but simple and unsafe operation. However, pilots of MiG Corporation – Nikolai Diorditsa and Mikhail Beliaev – did it perfectly. Hero of Russia Nikolai Diorditsa is a veteran of deck-based aviation and Mikhail Beliaev is to be admitted to cohort of shipborne pilots. He is the world's foremost test pilot whose air acrobatics on super maneuverable MiG-29M OVT delights spectators of domestic and international air shows. But former merits do not free from triumphant and joky ceremony – friends few times made him touch the fighter hook by…his "buttocks". MiG-29KUB is moved away to clear deck for the next aircraft. After while, having made a number of trial approaches the red-stared MiG-29K lands the deck. It is piloted by MiG chief pilot – Hero of Russia Pavel Vlasov. He brightly "grinds" the fighter in the deck. 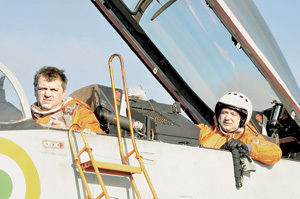 Vlasov is not afraid of the "vestiture" – he has been flying at Kuznetsov since the beginning of his test pilot career. 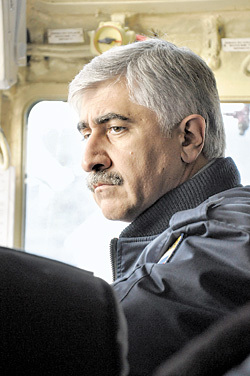 MiG chief pilot takes off again right after landing – he is thrown up by friends and Northern Fleet aviation command now. All are glad, but Mikhail Pogosian, MiG director General seems to be the most. He says that successful trials at Kuznetsov's deck will help MiG-29K/KUB to find new customers. Pogosian is sure that those aircrafts will be essential for Russian Armed Forces as well. Indeed, Vice Premier Sergei Ivanov declared early 2009 the inclusion of new MiGs into governmental rearmament program of Kuznetsov after Su-33 life time is over. Besides, completion of Indian "ship gulls" trials makes real plans of construction new Russian aircarriers discussed by Military Industrial Committee in September. The success at Kuznetsov is very important for MiG Corporation suffering decline. The company initiated development and serialization of new family of fighters. They inherited aerodynamics of MiG-29, but cardinally differ in combat capabilities and functional performance. MiG-29K/KUB are basic aircrafts of the family. Land-based aircrafts on their basis, particularly MiG-35, represent Russia in Indian Air Force tender. The talks of procurement another parcel of MiG-29K/KUB by Indian Navy are in progress. Report of Indian MoD officials observing flights at Barents Sea may speed up the transaction. After several landings and takeoffs at the vessel two fighters fly to Severomorsk and then – after fueling and recovery of pilots – to Moscow. Soon their ways will drift apart. MiG-29KUB along with first parcel of aircrafts will head for warm Indian Ocean. Most likely it will never meet Kuznetsov again. And MiG-29K will fly in Russia and return on the deck of Russian ship.